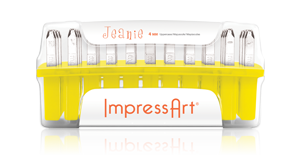 ImpressArt® is the world's leader in metal jewelry stamping tools and supplies. ImpressArt's innovative products make it easy for everyone from the novice to the metal stamping enthusiast to make high quality personalized jewelry. Until recently, almost all letter punches on the market were made to serve the industrial machine shop and tooling industries. With the growing popularity of custom metal stamped jewelry, we created ImpressArt's expansive line of metal stamps specifically for Artisans and Makers. ImpressArt metal stamps are precision-cut from hardened steel and are designed to last project after project. We test our stamps regularly to assure they have a sufficient rockwell hardness and are perfectly aligned.